Someone’s starting preschool very very soon. His school supply list called for one backpack with large zippered opening, no wheels. I let him pick out some fabric from his fancy fabric stash (all the great japanese prints I’ve acquired for Oscar use over the years) and this is what I came up with. I used some fusible interfacing to stick the already canvas-like fabric to some even heavier weight canvas and then cut my pieces out from there. I didn’t use a pattern but just cut out a backpack shaped front and back and then a 5″ wide or so strip to go around. I got some canvas webbing and D-rings for the straps, which I, of course, sewed on the wrong way so I had to cut them off and sew back on the right way because I can never get a thing completely right. My favorite part: I used this bit with driving cars from the selvedge to make a handle. Oh! and that in addition to sayings like “happy town” and “enjoy city” it says “poo country”. hee! I put that bit on the back though. You know, just in case some advanced classmate can read already. love the backpack and your ingenuity in figuring it out. Aww…I LOVE it! He’s adorable too. You’re so talented! Very nice! And very smart about preventing an unfortunate ‘poo’ incident! That is great fabric! And your handle idea is great! And what a precious expression on your preschooler! that is so adorable!!! i want one for me (forget kids, can’t we adults have cutie backpacks and chocolate pudding too?). well done- this is awesome! I love that!! Very clever! Wow, you made a backpack. Gee Whiz…….love it. Very cute…the backpack and the student! How very cute! And his backpack will not get mixed up with someone else’s, that’s for sure. Oh wow! You MADE your own backpack! I wish you HAD used a pattern, because I’d love to make one too. I’m just not so good at coming up with my own pattern based on an idea in my head. aaaaah, i remember my first backpack! It was nowhere near as nice as this one!!! oh- that fabric is the best! Love the fabric! Great backpack! That is the cutest pack, ever!! no one else will have it. rockin. 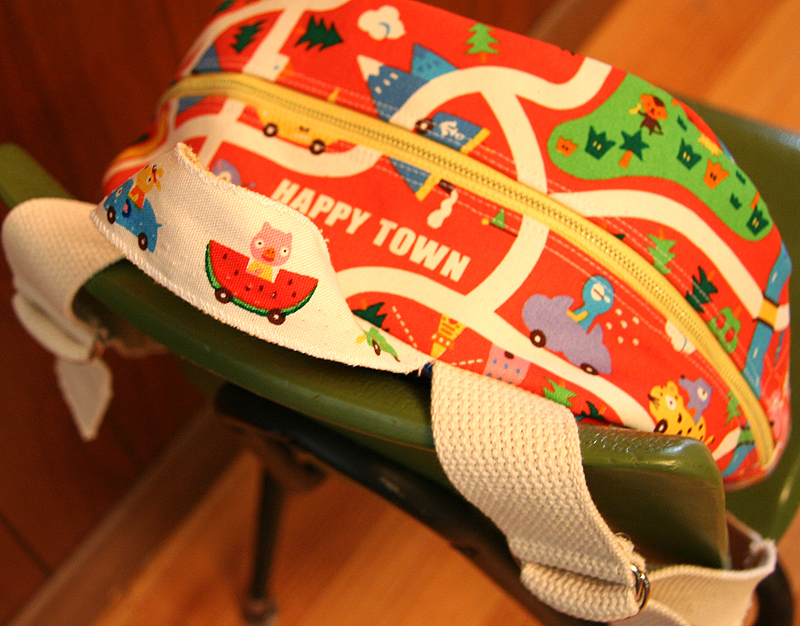 I have never even imagined making a backpack… that is absolutely adorable. Love everything about it. The color, the yellow zipper, the carry handle. I am counting the days until school starts, I don’t think any of us can take one more grilled cheese sandwich. Oh my, I love love love that backpack. And the fabric is one of the cutest I’ve seen! Lucky Oscar. Hope he enjoys preschool! What a fun backpack. I love to see he wonderful things you create! The back pack is super adorable. I’m amazed that you were able to keep poo off the front. That’s some skillz. Both the backpack and the boy are the cutest ever. And “poo country” has me giggling. Crazy Japenese translations! I have the same problems with d-rings. No matter how many I’ve sewn, I never get it right the first time. It’s gorgeous and what I really like is the way that you have made all the roads line up. Oh, I love your backpack! It looks very cute! What a lucky, lucky boy! great backpack!!! all the other school kids will want one just like his!!! Wow – what a gorgeous backpack!! I’ve made one rather dodgy skirt for my elder daughter but that’s about it!! What a love! Nice work! the backpack is so cute and so is your little guy! i am glad i am not the only one who bribes their kids to take their photo! The backpack is adorable…as is its wearer! I always treasured the items my mother handmade for me, and I’m sure your children will, too! I seem to have problems with direction of fabric too. I love it. He will have the only backpack like it. The fabric is awesome and Ivy is going for some big bucks on the auction! YAY! How wonderful and unique! It’s so nice to be the only one with a special-not-mass-produced item. Who knows though…you may have to be making more of these dandy backa packas once the other kids see it. I absolutely LOVE this! I only wish I had a clue how to sew or do any of the things I see on your site. It’s great inspiration for “someday”. Darling back-pack! The only thing cuter is the boy wearing it (I have to admit, I have a thing for little blonde boys 😉 ! The fabric is so great (I was going to say “cute” but my son always says boys’ stuff isn’t cute!). It’s nice that it’s properly sized too… I see way too many kids with backpacks hanging down below their butts (like my niece’s photo I got yesterday!) You are soooo talented! look at that zipper! your sewing skills amaze me! and that chocolate pudding bribe still works on Pete. . . I love this! I wish I had your talent (or the time to cultivate it). That fabric is darling. Oooh…babies starting school. Much too much for me! That backpack is adorable, but Oscar in the backpaack… aweeeee! CUTE! Wonderful!! I have been toying with the idea of making my youngest a backpack. I hate the plasticky character backpacks. Now I’m convinced! Thanks for the inspiration. What a great backpack, simply adorable! You did a great job. omg best backpack ever. so much more fun than boring spiderman superman xmen blah blah blah vinyl junk that you’ve seen a hundred thousand times. i pray my imaginary kids will be cool. You might have to make us less talented folk a backpack pattern! Cute boy and cute bag! OMG it’s so cute!!! I *never* write OMG in comments, but the cuteness of the backpack has overwhelmed my vocabulary. Yipes Oscar is big! I remember when you were knitting him baby sweaters, sigh. That is the most amazing backpack! When I saw the picture coming up I thought, wow I wonder where she bought that and then I read on and realise (as I should have right at the start) that you made it yourself! Wow!!! I am sure he is going to enjoy pre-school and that you are going to enjoy the time!! Wonderful backpack and so perfect for school. I love the “poo country” bit–made me laugh. Very cute the backpack and the student! that HAS GOT TO BE the cutest backpack and fabric i’ve ever seen. i wish i had some to make a backpack for my levi! OMGOODNESS!! It’s so cute! Where do you get your amazing fabric? Your kids are so lucky to have such a talented mama. I can’t wait to see their Halloween costumes *wink* My girls are already in the planning phase, but my talent only extends to glue and iron-ons. tricia, no, oscar doesn’t but his school is peanut free as I think most are these days? Soooooooo cute!! I love it. Aw, I just want to give him a giant KISS! Great backpack, Hillary! That is amazing. The moms at preschool are going to want you to make them one! I love this backpack. My twins start preschool right away as well and a larger backpack was on the list, but with baby number 3 due any day, they’ll just have to do with a store bought one. You are a great inspiration. Is that fabric that I scored for you from an online shop ages (years??) ago? How perfect to make a backpack from it. oh, terribly cute! It’s a perfect preschool backpack. I love that backpack! so happy! And it DOES have wheels! Already a rebel, is he? What a great backpack! I wish you would make one for my son. He is starting preschool next week (first time in school vs daycare)! Good luck to Oscar. what a perfect macaroni masterpiece carrier! i’m lovin’ this backpack. great job! ps. don’t forget to waterproof it! Ach! ADORABLE!! I am in a heated debate with my little preschooler about the lovely Disney Princess backpack that she wants that say “Where’s my tiara?” on them. L-O-V-E-L-Y. Since I have the sewing skills of a two-year old, I may atempt to make a smallish, lopsided item that may or may not resemble a tote bag. I don’t think so – I think you have to be very clever to make one of these! But, I appreciate her faith in me. Love the bag – love the blog! 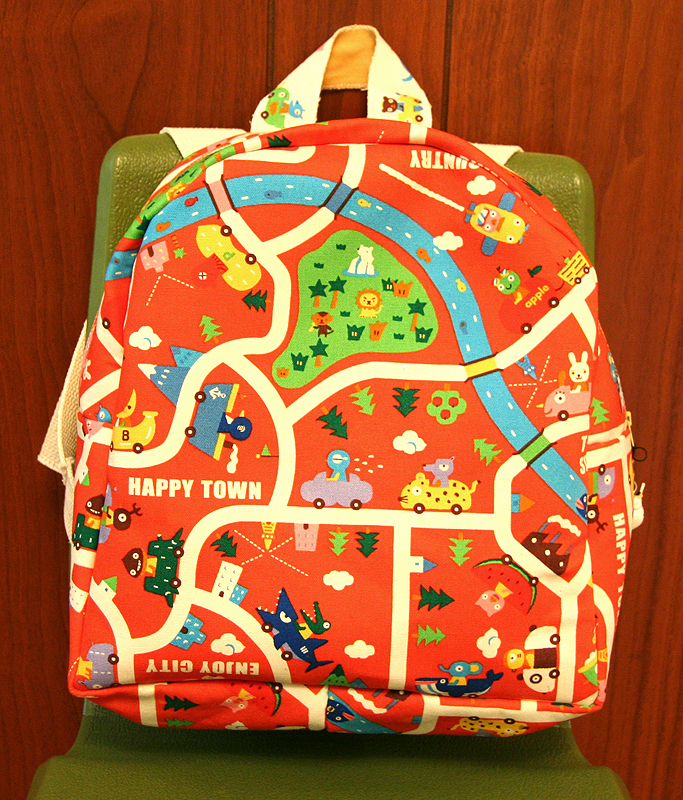 http://thatsillygirl.blogspot.com/2007/08/backpack-backpack-backpack-backpack.html I like that your’s is easy to open. *I* want a backpack like that! It’s amazing. Lucky Oscar! That is too cute!! And I really love that it says “poo country” on there. Like your little rebellious secret! I hope he has a great first day! It’s absolutely lovely! congratulation on the first day of school! we have a first day of high school on Wed. I can’t believe how time flies…. I love that back pack. I was going to make one for my son Alex for 1st grade but got scared and didn’t do it- I guess it IS doable. You are so talented. I didn’t realize that your sons name is Oscar. We are planning to name ours due in November, Oscar Benjamin. we have had some mixed responses. But I think it is a great name. I don’t often comment because I feel silly as the 84th person to say “gee, that’s great!” but I do enjoy checking out all the fab stuff over here. Thanks for sharing it all! That’s fantastic! I’ve been wanting to make one of those for ages. I’m newly inspired. Thank you! Absolutely adorable!!! Oscar and the backpack of course! What a cute backpack for a cute kiddo! I had a good LOL at “poo country”! I bet whomever was in charge of the english on the fabric did too! Lol!! How is it possible one little human could be so cute? LOVE THE BACKPACK! Love that fabric! Great job on the backpack design. That has to be the sweetest backpack I have ever seen (as is the lil one wearing it!) Is it wrong that I am over 40 and want one just like it? That’s so terrifically cute, it’s not even funny. Your son is adorable and will be telling all his friends that his MOM made his backpack when they say how much they like it and want one too!